I've expressed my opinion on this many times before......in fact one of my very first blog posts back in 2013 was dedicated to the very same topic. Occasionwear......which for me these days means either one of those few and far between weddings or if I'm lucky a trip to the races. You'd think I'd be all over the excuse to splurge on a new outfit.....but oh no! I hate spending my money on outfits that might only see the light of day a couple of times. And besides there is some amazing dressy gear on the High Street that won't break the bank. 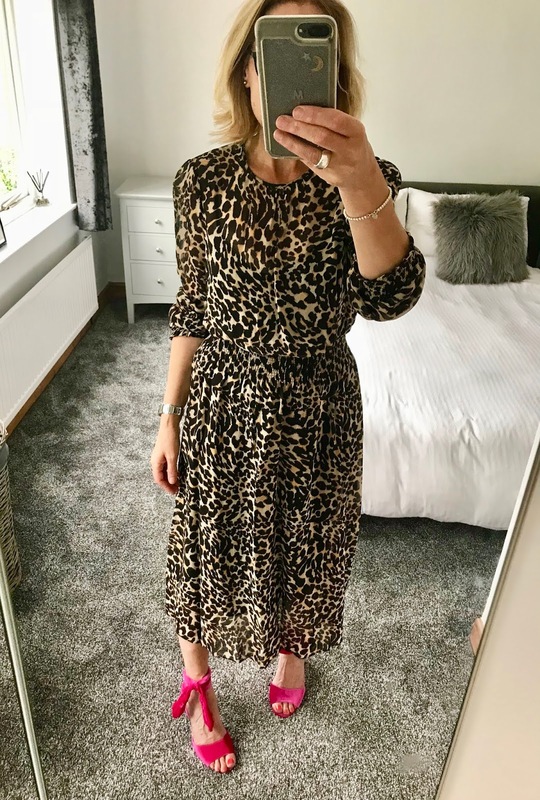 New Look presented me with a bit of a challenge to pick a head-to-toe outfit for an occasion and I'm happy to report that it came in at just under 80 quid. What's not love about that! A view from the top! 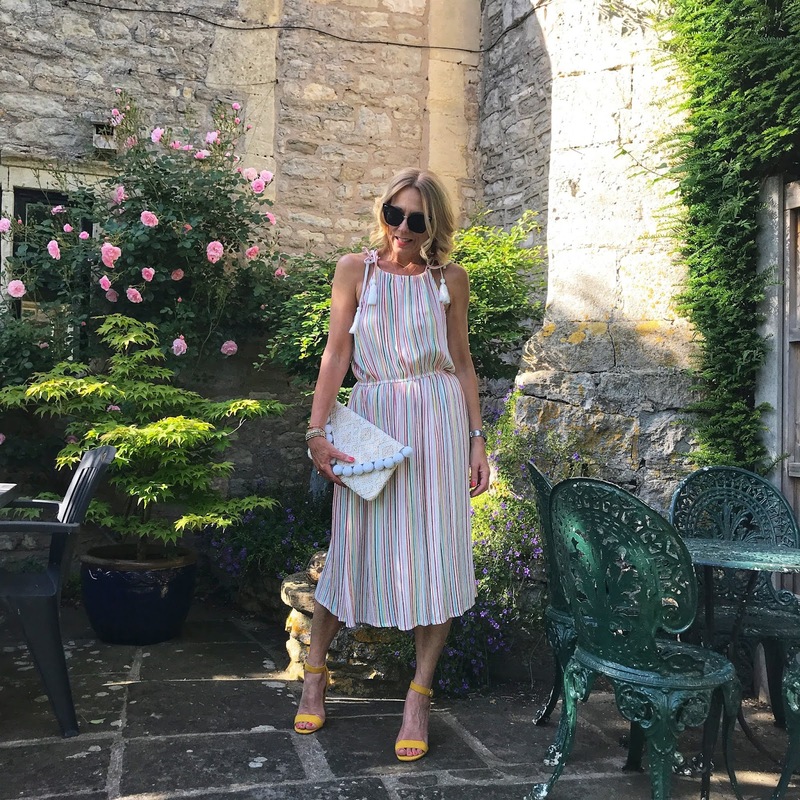 The dress is Grecian style, in a cheesecloth type fabric with multicoloured stripes. I'm wearing a size 10. I would probably wear a slip underneath (I'm turning into my mother!). 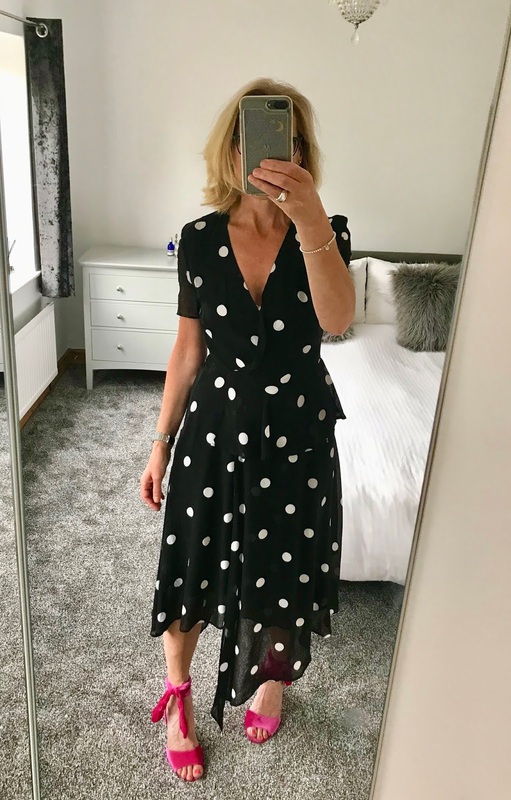 What's great about this dress is that it will also be perfect for my next holiday in August.....we are off to Croatia. A close up of the details! The cone heeled sandals are amazing with a cropped raw-hemmed jean for a night out! 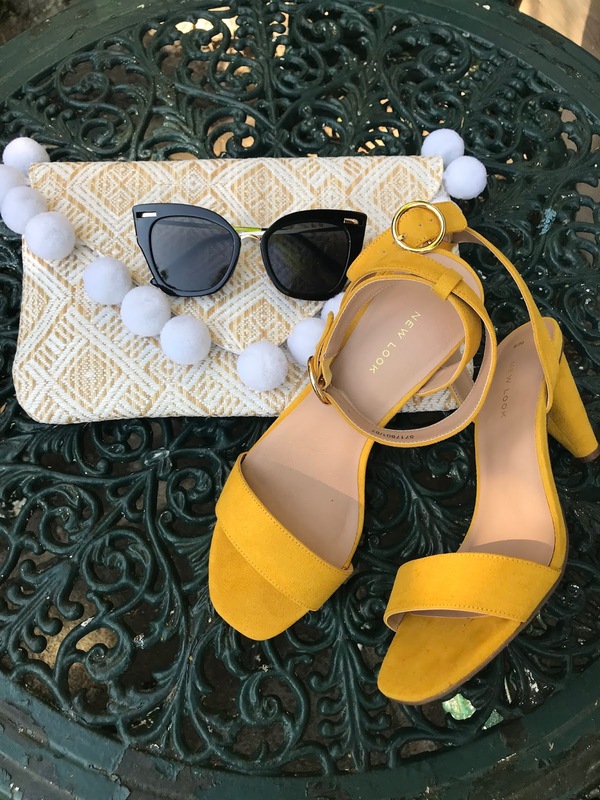 How spectacular are these sunnies for £8.99! Now this outfit will be just fine and dandy as long as it's a lovely day. I am off to a wedding in a couple of weeks time and this will be perfect as long as the sun is shining. But it is worth having a couple of options up ones sleeves.....just in case the weather isn't on my side. Enter more High Street gems that have been hiding in the back of my wardrobe just waiting to be loved again. So. We've covered that perennial favourite.....stripes, now onto a more current obsession......spots! This is H&M, bought at the end of last summer and only worn once.....for a wedding! What did I tell you?! It's monochrome and a pretty shape, perfect with sandals or trainers. I predict this will be in my wardrobe for the foreseeable.....as will the next dress, from Zara. Another classic print that we can't seem to live without. And for the sake of options I thought I'd better chuck another pattern in. It may pay to be armed with something floral as well. 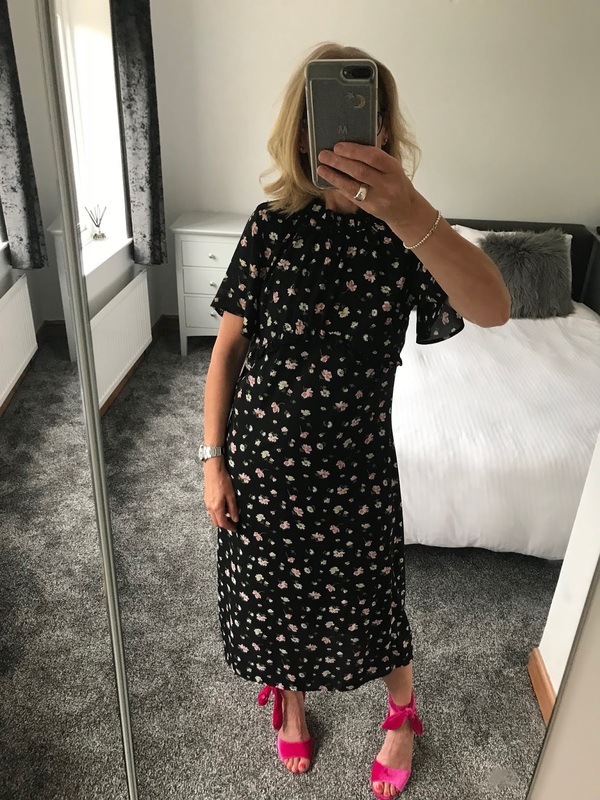 Now this midi dress would actually look a lot better with the yellow New Look sandals but this post has been hastily flung together after a couple of requests from readers to do occasionwear hence the mirror selfies. So, I would love to hear your views on occasion wear. Are you like me and totally frugal in buying something reasonably priced and dual purpose to get maximum usage from it? Do you buy from the High Street or is a a good excuse for you to go all out on and splurge on something more expensive? I'm all ears! The first New Look outfit has been gifted to me but I was not obliged to blog about it, just to share on Instagram. I love it and so wanted to share as I genuinely have had requests from readers for occasion wear. Everything marked with an * is an affiliate link and I may make a small commission if you purchase anything via the links. Thank you for reading and supporting my blog. I hope to be back tomorrow with a quick update on my last post.......my next step about what to do regarding the big M! Basically need to express your work is uncommon. The clarity in your post is basically astounding and I can acknowledge you're an authority with respect to this issue.. You shake and please bear on the repaying work and Thank you such an awesome sum for pondering your substance and your per clients. Your blog held my preference perfect to the plain end, which isn't for the most part a basic movement!! A commitment of thankfulness is all together for the traditional blog. I'm can little bit slow to the party and have only just read about your Big M (menopausal!) wobble. It certainly does blind side you! I wanted to sympathise but also to say (probably quite shallowly & in no way offering pearls of wisdom!) 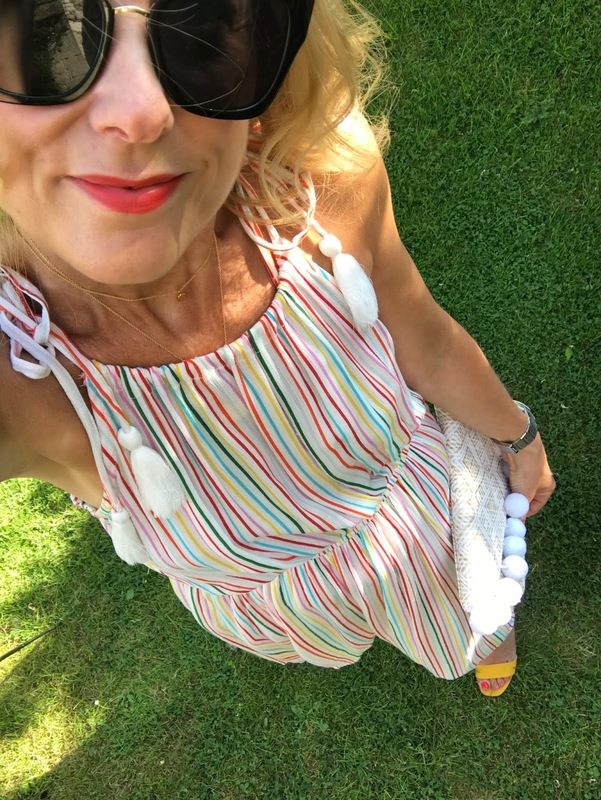 But both my daughter and I love your Instagram posts, your style is fab and very affordable, you have influenced my style greatly at an age when I'm thinking 'too old for this' yet 'too young for that' and made me feel a lot more confident about my choices. So I thank you and wish you well in the Big M journey x! !